Our staff is here to help golfers fine-tune their swing with personalized coaching and club fitting. 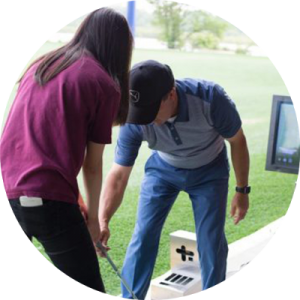 Whether you play for an entire afternoon or an hour during your workday, FlyingTee has all the tools you need to lower your score. The best way to practice anything is to have fun while doing it, and our practice application makes practice fun. Choose your club, and hit as many shots as you want while FlyingTee’s proprietary technology tracks the distance, spin and a variety of other measurements to help you improve. We will show you how you are improving over time. Who says camp is just for kids? We’ll soon be adding golf camps for people of all ages to our golf-repertoire, so keep checking back for details. Tall, short and everyone in between. Having the right tools is necessary for any endeavor. At FlyingTee, we offer personalized club fitting, so you can get the best quality clubs fit just for you. Tracy Phillips started playing golf when he was two years old and has been ranked the #1 Golf Teacher in the state of Oklahoma by Golf Digest.